Updated Sunday April 8, 2018 by West Bend Little League. Location: Good Shepherd school located at 777 S. Indiana Avenue - lower parking lot entrance. Umpires MUST register online prior to the clinic AND RSVP by 4/9 to Dave regarding attendance. Alternative date for training is 4/15 at Germantown Little League. Contact Dave Homuth for more details. Session 1 > 11 am to 3 pm: new umpires through those with 2 years of experience . Session 2 > 3 pm to 4:30 pm: umpires with more than 2 years of experience . This year, WBLL will be using resources from District 1. 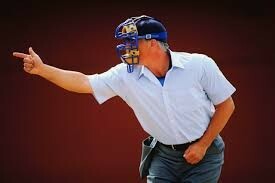 The main presenter will be District 1 Umpire in Chief Wally Baehr. There will be two sessions designed to tailor training to the various levels of umpire experience. Session 1 will be for beginners and those with less experience. Session 2 will be for the more experienced umpires and focus on “big diamond” mechanics, rules and case studies. Please contact Dave Homuth (five_homuths@att.net) if you are or are not going to attend for a proper head count. A plan is being worked out for those who cannot make it to attend another District training session. More details on that to follow.